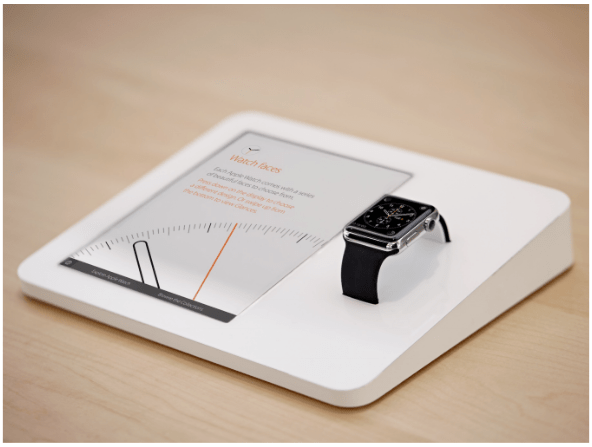 In its retail stores, Apple uses special Apple Watch display units to allow customers to test the Apple Watch ahead of making a purchase. The units, which have been available in stores since try-on appointments began on April 10, combine a functional Apple Watch (secured to prevent theft) with an iPad mini that gives details on various aspects of the device. Most of us probably haven’t stopped to wonder about how these units work, but new Brazilian regulatory documents and images shared by Blog do iPhone. 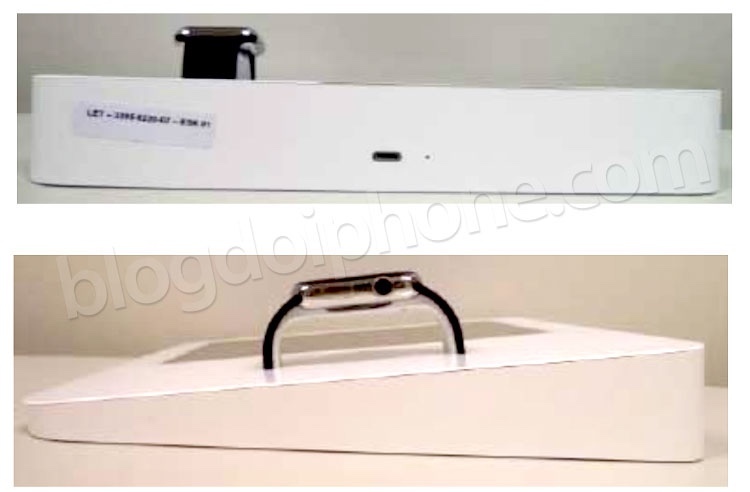 According to BlogdoiPhone, Apple Watches inside the display cases have special bands that incorporate a Lightning cable, which plug into the case to connect to the iPad. When an app is opened on the Apple Watch, this connection relays data to the iPad on what’s being viewed, letting the screen display additional information about each feature. The specialized Lightning port band connects to the hidden 6-pin diagnostic port on the Apple Watch, using it to establish a connection between the watch and the case. It is not clear if the diagnostic port connection also allows the Apple Watch to charge, either through the iPad or through a battery built into the unit, but such a function would explain how the Apple Watches manage to stay powered through a full day of continual usage by customers. 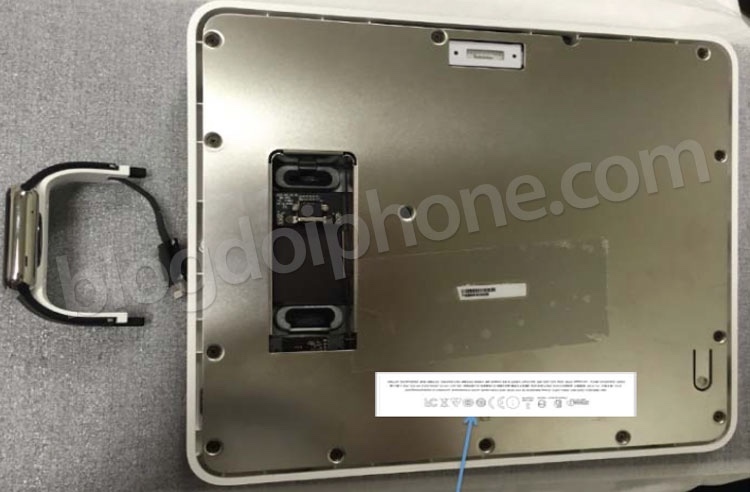 One side of the unit also includes a USB-Type C port or a Lightning port, which we have previously heard is used to charge the entire unit on a nightly basis, so it’s possible there’s a built-in battery that powers both the iPad display and the Apple Watch during the day. It is not known if the Apple Watches used in the display units are identical to retail Apple Watches aside from the bands or if they are custom built with extra functionality, but there has been speculation that the Apple Watch can charge through the diagnostic port. Specifically, the engineers behind the Reserve Strap accessory in the works for the Apple Watch have said they have confirmed the port can be used for charging. Apple recently introduced band design guidelines for third-party accessory manufacturers, and while the guidelines say bands must not integrate magnetic chargers, there’s no mention of the diagnostic port, leaving its full capabilities largely a mystery. 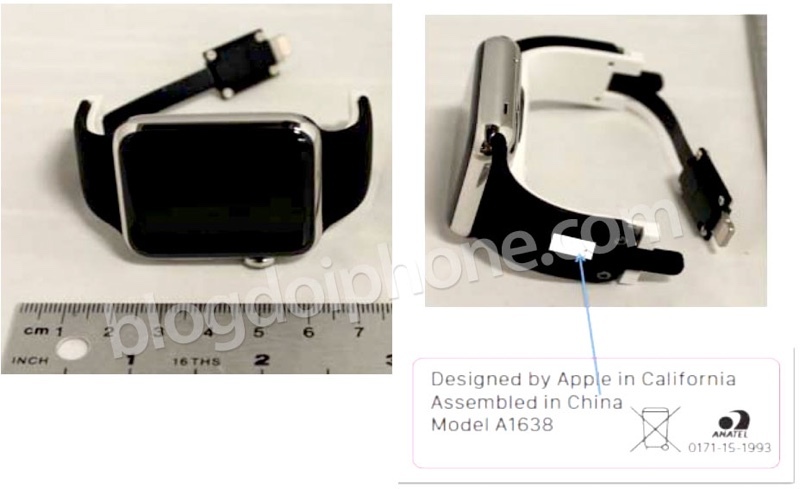 On watches delivered to consumers, the 6-pin diagnostic port is hidden behind a cover that resembles the SIM slot on an iPhone 6. The Brazilian Agency of Telecommunications (or Anatel), where the documents and images originated, has approved the Apple Watch and the in-store display units, suggesting Apple is gearing up to begin selling the Apple Watch in additional countries in the near future. This entry was posted in Apple news and tagged Apple Watch, Retail Display Units. Bookmark the permalink. Apple Plans Bus, Subway, and Train Route Navigation for iOS 9 Maps.